JFH News: Be In The Audience for TobyMac's Performance on Fox & Friends TOMORROW! 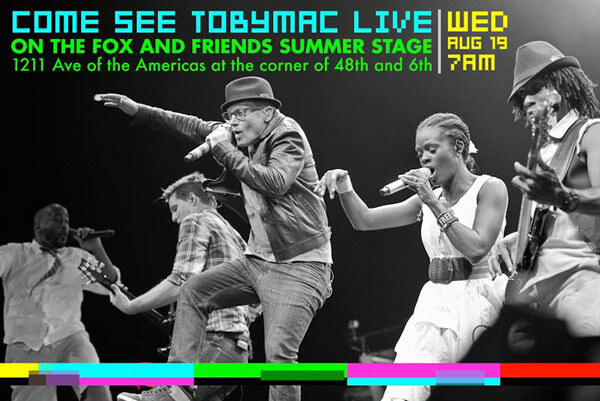 Be In The Audience for TobyMac's Performance on Fox & Friends TOMORROW! TobyMac and his band DiverseCity will be in New York City on Wednesday, August 19th, performing on the Fox and Friends Summer Stage in Times Square. The show begins at 8:45am, but be sure to be there at 7:00am to ensure a spot in the audience. For those of you who can't make it, Fox and Friends, which is on the Fox News network, will be airing parts of the concert throughout the show, 7-9am ET. They will also broadcast a song live from their website at 9am ET on the "After the Show" Show page.